US Dollar ... Can you guess the total amount of this stack of cash? I personally don't really enjoy the life in Phnom Penh compare with Seam Reap & Sihanoukville because this place is too crowded and it's full of busy night life. Due to tight schedule, i only manage to overnight 1 day before travelled north to Seam Reap. Tonle Sap Lake is the largest Fresh water lake in South East Asia. After 4.5 hours bus travelling to Seam Reap, we managed to get ourself tour guide which can speak fluent in Chinese with quite reasonable rate. After discussed with the guide on our planned itinerary, my friends and I decided to visit Tonle Sap Lake for our very first Sunset in Cambodia. This place is very special. You can see Cambodians' floating house are sitting on the left side of the lake; and, Vietnamese are on the right. Whiu ... Finally, I arrived Angkor Wat - one of the world heritage of 2007 World 7 Wonders. Carving on the wall is so deep and clear. Corridor that full of Wall Carving, it's magnificient! This is another famous temple after Angkor Wat. One of the scene for movie "Tomb Raider: The cradle of life" was took also taken from Ta Promh Temple. Ta Promh is an unforgettable temple due to its massive tree spread around the temple. Some of it was growth on top on the building itself. I still looks very short even i step on the root of this tree ... It's really Massive! The beauty between man-made and mother of nature's creation. Young lady, Old tree and Beautiful ruins in Ta Promh. Part of stone carving in the ruins. 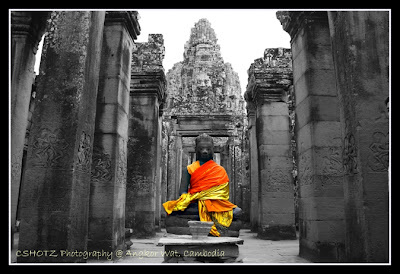 Bayon temple is located inside Angkor Thom - a mighty Khmer empire City dated back to the 12th century. Bayon is very unique due to the design and layout of the temple. No wall surrounded the terrain, and the style is more to buddhist. There will be 4 face sitted on top of every tower in Bayon. I loved Bayon so much! Local little Cambodian boy resting in Bayon. Face carved in Bayon temple. Buddha statue sitted in front of Bayon Temple main entrance.